The City of Dundee, on the northern banks of the Firth of Tay is often passed-over as a place to visit and enjoy, by both home-grown and overseas visitors alike; drawing a bad press from the former and a generally ignored by the latter. Yet, looking beyond its less glamorous architecture, and a dodgy ‘80s reputation that it finds hard to shift, Dundee has an incredible history, and some fantastic places to visit. It’s well worth the second glance, and indeed a second chance. Guarding the mouth of the mighty River Tay, ancient Dundee was a cluster of Iron Age dwellings dominated by a set of forts, including one that lent its name to the town that emerged: Dùn Deagh (Fort on the Tay). This fortress of stone and timber probably sat on the Law; a 570ft high volcanic hill with commanding views south to Fife and north to Strathmore. Today, modern Dundee sprawls around its base and slopes down to the shore; and here the story of the city really begins. There is very little known about early Dundee, except from a few charters and street-name clues (e.g. Castle Street); but in 1191 it was granted special privileges by King William the Lion raising its status to that of a Royal Burgh with its own substantial market and trading rights. The town’s location made it an idea place to buy and sell goods brought from the hinterlands of Angus and Perthshire; and also as a port to bring goods in from continental Europe. 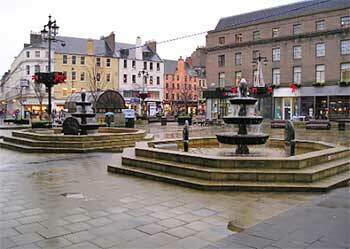 Dundee in the late medieval period would certainly have been a lively and bustling commercial centre. The principal authority in the town was the Crown, who owned the now long since vanished Dundee Castle, and the king probably had extensive properties in the area. In addition, land would have been owned by nobility, merchants and by the church. The earliest churches were established around what was then the city square, but David I decided to build a new church dedicated to St Mary just outside the city walls. In the 15th century a fine stone church was built on the same site, and now forms the focal point between the Overgate and the High Street. It is well worth a look around. As the wealth of Dundee grew, so did its merchants and lairds. The Scrymageours were one of the key families, often holding the post of Provost (mayor) and High Constable. Their town residence was Dudhope Castle on the southern flank of the Law, which is now part of the University of Abertay. Other castles around the city include: Claypotts (built by the Strachans, and once owned by the Jacobite hero John Graham of Claverhouse) and Broughty Ferry castle (looked after by Historic Scotland and with a museum run by Dundee City Council). Both castles (Claypotts is external viewing only) are on the eastern side of the city. But, the story of Dundee is not about kings or lords; it’s about industry and hard working, inventive people. The area around Dundee was once famed for its wool and flax production, and the city provided both the market and the means by which the woven material could be exported, and so it became a natural hub for weaving. From as early as the 16th century huge bales of flax and wool were being brought from across the country to be carded, softened and woven. Whale oil is one of the best substances out there to soften tough fabrics like flax; and with Dundee’s sheltered position on the Tay it grew into a major whaling port, where the oil could be traded and more importantly, ships built. Those ships would soon bring a new fabric that changed the city forever – jute. It is often forgotten today that the Scots drunk heavily from the cup of the British Empire; and as that empire grew Scots could be found leading the way in enterprise and ambition. Jute, which grows naturally in India, is a strong, durable and hard-wearing cloth that has a myriad of uses. The problem is getting it soft enough to make it usable, and the only place in the world with the know-how, experienced workforce and the raw materials was Dundee, and Scottish entrepreneurs took full advantage. The first bales of jute arrived in 1820, but with a near monopoly in manufacturing it exploded into a massive industry; and with it came a huge population boom. In 1841 there were 45,000 people living in the city, by 1901 that had grown to 161,000 with over 50,000 directly employed in over 100 mills. The mill owners, the so-called ‘Jute Barons’ were among the richest men in the world. Verdant Works, opened in 1833, and the last mill still operating in the city, tells a magnificent story of the rise and fall of ‘Juteopolis’. It was hard work, and conditions were harsh; with mainly women employed. This though gave Dundonian women more money and a sense of freedom than elsewhere: and a sense of adventure too – take the example of the missionary Mary Slessor. Eventually, manufacturing moved quite sensibly to India and it was the end of the boom: but it was an incredible time. Whaling was on its knees too, but the ship-builders on the Tay had one last hurrah before the game was up. In 1900 the last uncharted part of the globe was Antarctica: un-mapped and unconquered. The British wanted to know what was down there and so set up an expedition in 1901 led by Captain Robert Falcon Scott; all that was needed was a ship – one that could cope with extremes of temperature and break through the ice. 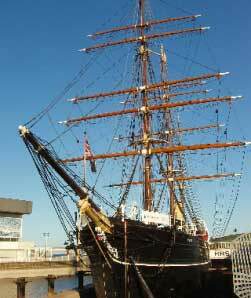 Dundee had been building boats like this for centuries to cope with the Arctic, and so here on the Tay was constructed one of the finest wooden ships ever – The RRS Discovery. Today, she’s back in the city, docked near the Tay Bridge, and one of the finest attractions in Scotland. The Discovery isn’t the only famous ship that Dundee boasts. Berthed just down from Scott’s ship is HMS Unicorn; a 46 Gun frigate built by the Royal Navy in 1824 and the 6th oldest ship afloat anywhere on earth. It was built in the heyday of British ocean power, when Britannia literally ‘ruled the waves’. However, as a wooden ship her day in battle never came as iron technology took over; so for a hundred years she played a role as a training ship in Dundee. Now lovingly cared for, this relic of a bygone age is a real hidden gem. Even from this short introduction you can see there is plenty to see and do, and plenty more to find out. It also lies close to historic Arbroath Abbey, quaint Barry Mill and beautiful Glamis Castle; and is only a 20 minute drive to St Andrews. 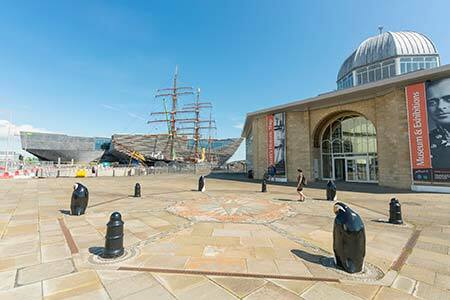 Dundee is also off all the normal touristy haunts, and is all the quieter and charming for that – a town you take at your own pace, but one that not only surprises, but does so again and again.